Well it has been a long while since I recorded an acoustic guitar piece, so this weekend past, I decided to resolve that deficit and record a new song. I remember a friend sending me a video of Simon Fox playing this particular piece in a live setting a few months back, and I was immediately taken with the song, which had a lilting Celtic cadence, combined with the feel of a lively jig. Thankfully, Simon provides the tabs for all his songs on his website for free, so I downloaded them and learned "The Fisherman". Technically, it was not an overly difficult piece, but the 'trills' proved to me more difficult that I thought. Strangely, I find that some days they seem to come off perfectly, and other days, they just don't seem to work for me. On the day I recorded this piece, they weren't working as well as I would have liked, but I persevered anyway. The other thing that I found I needed to work on was the timing of this piece. There is a dance like pace that needs to be maintained even though there are those trills and several syncopated notes to break the melody up. I also decided to go a little overboard on recording this one, and used 4(!) different mics to capture the guitar sound. I will post more on the details of that in another post, I think. This was played on my Taylor BTO custom acoustic. I had recently put pure Bronze strings on it to see how they sounded. While I like the wamer, softer sound, they didn't seem as smooth under my fingers, and string squeak was a big problem, but I am relatively happy with the end tone that I got. Here is "The Fisherman". Enjoy. Well... Last post I mentioned about the app that I wrote in under 2 weeks and submitted to the app store. It turns out that once you get the ball rolling, it is mighty hard to stop. Which basically means that in December 2014, I ended up writing not ONE, but TWO apps and submitted to the app stores. After I had finished development on BlissBank, I was on a high. Intellectually and energy wise, I felt like I was crackling and needed to keep those creative juices flowing. So even as I finished hitting the submit buttons on the app store, I was starting to create the framework for another app - MusicKata. MusicKata is closer to my own heart, as it combines my passion for music and programming. I have always struggled with practicing the songs I want to learn on guitar, especially complex fingerstyle or classical pieces. Once someone said to me - "Wow, you must have spent HOURS practising that piece!". To tell the truth, I hadn't a clue how many hours I had spent on it. I guessed maybe 20 or 30 hours, but I thought it would have been good to know an accurate figure. That is why I wrote MusicKata. 'Kata' is the Japanese word for a form or a practice routine, and I thought it would be apt for this app which helps you to track your practice time over many pieces, as well as help you with that practice via providing a steady metronome for scale exercises etc. The other thing that I thought I would like to know is an exact measure of how much I have improved over those practice sessions. I thought that it would be nice if I could go back in time to hear just how bad I was at certain sections back in the early days - if only to reassure myself that I *was* getting ahead now. So, MusicKata has the ability to record short snippets and store them against the piece, so that you can review them later. Hopefully this app will be ready on the app stores in January 2015. I feel elated to have accomplished so much, yet a little mentally fatigued after an intense month of programming. I am not sure if there will be a third app issuing forth in the near future. Many years ago, I had read the graphic novel "Usagi Yojimbo" by Stan Sakai. It is a story about an anthropomorphic rabbit called Miyamoto Usagi and his travels and adventures around ancient Japan. In one of those adventures, Usagi comes across a Komuso monk ("monk of emptiness") who played the Shakuhachi flute. From that moment on, I was fascinated with this instrument. In the story, the monk explains to Usagi that the flute was a way of meditating, and trying to copy the music of nature. I had been thinking of getting one of these, but when I researched online, I noticed that the best flutemakers around charged approximately $2000 up to $5000 for a hand made flute. But a couple of weeks ago, I was doing another search and I came across Perry Yung's website, where he explains more about the flutes, and also where he sells a range of flutes from beginner 'Earth' models for around $150 right up to the high end ones, that take a year to make and are worth $2000+. I decided to order an Earth model from Perry, and he was great during the initial contact and enquiry. He even made a short demo video for me of the Earth model flute that he had. I decided to go ahead, and Perry finished binding the flute for me, as well as applying a coat of traditional lacquer to protect it. It arrived earlier this week, and I was as excited as a kid at Christmas. This is a 1.8 flute, and tuned to 'C'. 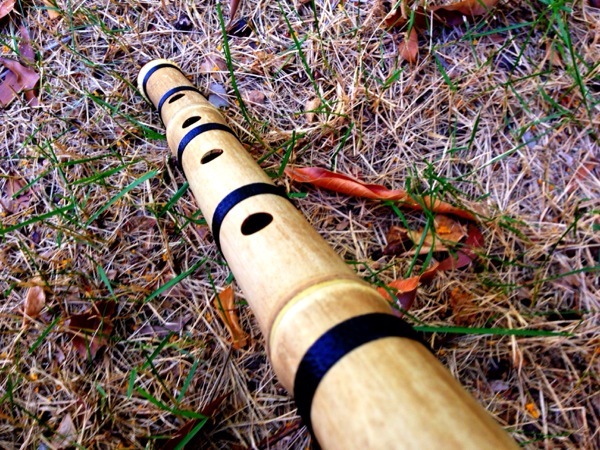 The flute plays the pentatonic scale, and by breath control, you can achieve two octaves. One thing I've discovered, is that it is not easy to play the Shakuhachi. There is a lot of work to do with positioning the flute, as well as my breathing, in order to get the proper sound. After about 10 minutes of playing, I am quite light headed and giddy from the breathing, which I think is a GOOD thing, because I've noticed recently that my sedentary work style has lead to very shallow breathing and a general level of unfitness. Perry included a great CD and booklet with the flute, which will hopefully help me along my journey. This is an instrument best taught by a teacher, but alas there are none in Darwin, so I will have to soldier through with Youtube videos and the book/CD set.